Buchanan got to do color remakes of a handful of black-and-white AIP releases, which were bundled together and then sold directly to American TV. The budgets on these were extremely low (they were all shot on 16mm) and the end results were extremely bad. Amongst this group of re-do's were THE EYE CREATURES (1956), a remake of INVASION OF THE SAUCER MEN (1957), CREATURE OF DESTRUCTION (1967), a remake of THE SHE CREATURE (1957), IN THE YEAR 2889 (1967), a remake of DAY THE WORLD ENDED (1955) and this one, a remake of Corman's (underrated) IT CONQUERED THE WORLD (1956). For some reason, Zontar would go on to become the most famous of all of these. At Zone 6 United States Orbital Rocket Control and Tracking Station, Dr. Curt Taylor (John Agar) and his colleagues are overseeing the launch of a laser rocket into space. Everyone seems to be happy about the successful launch aside from Keith Ritchie (Tony Huston). A brilliant scientist in his own regard, Keith seems to know things he shouldn't really know, like that "Alien intelligence watches us constantly!" and that a previous rocket that exploded was "a warning from other planets to keep the Earth in its place." Three months pass since the rocket's launch and things are seemingly returning back to normal for Curt, his wife Anne (Pat Delaney), Keith and his wife Martha (Susan Bjurman). At a dinner party, Keith pulls Curt aside to show him some radio equipment he has tucked away in a closet. He claims the machine he's created can use lasers to reach all the way to Venus and that he's been communicating with aliens there; in particular an alien named Zontar. What sounds like static to Curt, Keith claims is "hyperspace hypnotism." Since Keith has the reputation of being a loon, Curt brushes him off and his put-upon wife tries her best to be understanding as Keith sits by his radio equipment all night waiting to hear back from an alien he assumes is his friend. Because the 50-million-dollar satellite seems to be having problems showing up on radar, the space team decide to protect their investment by bringing it back to Earth for maintenance. To their surprise, the satellite abandons its own orbit and disappears yet again. 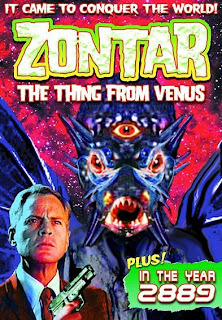 That's because Zontar has hijacked it, hitched a ride on board and guided the ship back to Earth and into a cave above some hot springs so that the environment is compatible to that of Venus. A massive power outage follows, with all electricity, watches, clocks, cars, etc. ceasing to work. Keith continues to communicate with Zontar over the radio and gives him the names of all the important people in town, including Mayor Sidney Parker, Chief of Police Brad Crenshaw (Bill Thurman), chief security officer of the instillation General Matt Young (Neil Fletcher) and even his own buddy Curt - head of the satellite project. The alien sets about sending out bat-like "injectopods" to insert control devices into the back of victims' neck so that the alien can possess them in its attempt to take over the small town. And from there, the world. This plays out almost exactly as Conquered did, with identical dialogue and scenes. People will mock Corman's movie, but aside from the incredibly silly-looking alien monster, it's a well-acted, well-written and thoughtful film. Seeing how Zontar uses the same script, it's amazing how bad this really is. For starters, it sticks so close to the original that it's utterly pointless and the only noticeable change (a laser gun introduced at the very end) doesn't quite cut it. Second, no real improvement has been made in the presentation of the alien. The one here is just as bad (and not nearly as charming or memorable) as the one in the 1956 film. And finally, and this is a big one; the cast is just dreadful and their combined lack of talent turns this into a laugh riot. Comparing the actors here to the cast of Conquered will give one a whole new appreciation for what Peter Graves, Lee Van Cleef and, most especially, Beverly Garland brought to Corman's movie. All that said, this is less offensive to sit through than most of today's garbage remakes. A bad low-budget remake of a low-budget film just goes down easier than a bad big-budget remake of a low-budget film. Buchanan co-scripted with Hillman Taylor and credit to the original Conquered screenplay is nowhere to be found in the credits. Future director S.F. Brownrigg was the sound supervisor and Annabelle Weenick (star of Brownrigg's most-famous film, DON'T LOOK IN THE BASEMENT) was the dialogue director. There's a DVD from Retromedia. Like most of the director's other films, this is a public domain title. Hilariously awful dialogue, robotic acting, an alien creature that looks like something that should be cracked open and dipped in butter and swishy boi aliens who walk like they have something shoved up their asses and talk like they have a learning disability are just three of the reasons Teenagers from Outer Space is one of the best bad movies there is. A quintet of male aliens land on Earth in a screw-shaped spacecraft and immediately start surveying the area. They need a breeding / growing ground for creatures called "gargon;" which are their reserve food supply and are played by Maine lobsters. The fast-growing creatures adapt well to the Earth's atmosphere, so the aliens plan on bringing a thousand more of them back and letting them graze on whatever happens to be living on our planet until they reach maximum capacity. A defector amongst the group is Derek ("David Love" / Charles Robert Kaltenthaler), who has learned how life used to be for their kind from an outlawed book. On their planet, children are raised to be obedient machines in a "supreme race" and never know their birth parents or about love or kindness. After unsuccessfully trying to get them to go to an uninhabited planet instead, Derek gets into a minor scuffle with the other aliens and runs off. With an identification tag of a dog named Sparky (that got zapped to a skeleton with a "focusing disintigrator gun") in hand, Derek makes his way to a small town and finds the address on the tag. At the home lives sweet, orphaned teen Betty Morgan (Dawn Anderson, formerly Dawn Bender and a popular radio actress in her day) and her guaradian, Gramps (Ed Wood movie regular Harvey D. Bunn). Thinking he's there to rent out one of their rooms, Betty and Gramps decide to put him up and let him borrow clothes. Meanwhile, the smug, mean-tempered Thor ("Bryan Grant" / Bryan Pearson) has been put in charge of hunting down Derek - the son of their leader - while the spaceship captain (King Moody) takes the rest of the aliens back to their home planet. They'll eventually return with a fleet of spaceships to drop the thousands of gargon monsters off. Armed with a toy cap gun, Thor blasts nearly everyone he comes into contact with, reducing them to skeletons. Because her boyfriend reporter Joe (played by the director as "Tom Lockyear") is too busy covering the sudden rash of murders going on, Betty takes Derek under her wing. They go to her flirtatious friend Alice's (Sonia Torgeson) home to swim, then go to where her dog was killed (also where a baby gargon has been left behind in a cave), all the while Thor runs around town zapping people. Before long, a guy he gets a lift from, a gas station attendant, a professor, Alice and a couple of cops are dead. After being injured in a stand off with police, Thor forces a doctor to extract some bullets from him and then kidnaps his nurse and then kidnaps Joe. Meanwhile, the small gargon left in a cave grows to monstrous size and terrorizes the locals. Derek and Betty must find a way to elude the trigger-happy Thor, stop the giganti-lobster and thwart the other aliens when they finally show up to drop off more gargons. 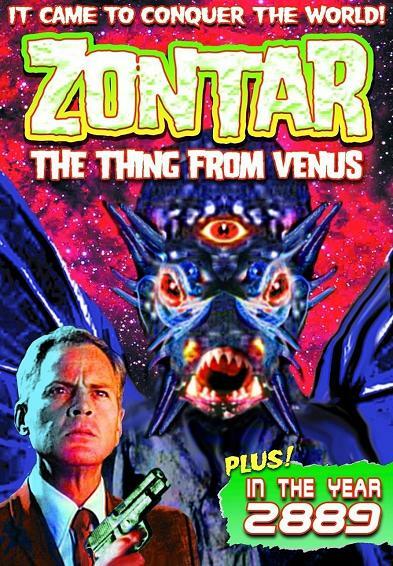 I could pick holes in this plot all day long if I wanted to and go on and on about how laughable nearly every single aspect of this low-budget production is, but there's absolutely no need to MST3K it. If you're a bad movie lover, watch it. It's that perfect example of a bad movie made with serious intentions that's not only wonderfully, hilariously inept but also extremely charming in its stupidity, simplicity and sincerity. For a very long time, there was a mystery (and a lot of misinformation floating around) about this production, its director / writer / producer and its stars that's only recently been coming to light thanks to a few dedicated fans who've hunted down some of the people involved. The director was a UCLA graduate in their theater arts program and was the boyfriend of the (male) star at the time. The two split up at one point and Graeff passed away in the mid-80s. Co-star Pearson and his wife, Ursula Hansen (who has a small role as the professor's secretary), put up much of the budget and claim that nobody actually got paid to do this film. It was filmed in 1957 and not released until years later. Needing a co-feature to bill with the first Godzilla sequel, GIGANTIS, THE FIRE MONSTER (aka Godzilla Raids Again), Warner Brothers purchased the rights to Teenagers for a reported 28,000 dollars. There's badly-incorporated stock footage spliced in for the lame finale and you'll recognize the stock music score from many other sci-fi and horror films, like the same year's THE KILLER SHREWS (1959) and NIGHT OF THE LIVING DEAD (1968). Now in the public domain, this is an easy title to find on numerous budget labels.